Email is possibly today's most important business tool but its use also carries many risks. Scalable, secure archiving, email continuity, data leak prevention - not to mention the constant onslaught of spam and malware - are just some of the issues that IT professionals have to deal with on a daily basis. 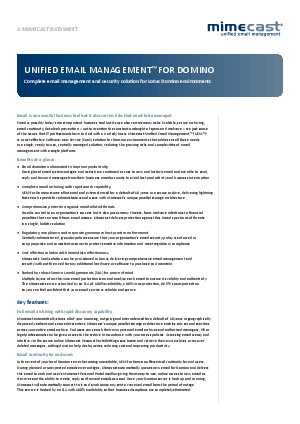 Mimecast Unified Email Management (UEM) is a cost effective Software-as-a-Service (SaaS) solution for Domino environments that addresses all these needs in a single, ready-to-use, centrally managed solution, reducing the growing risks and complexities of email management with a single platform.